I had soup curry today. It's especially delicious on cold days. Why, it's delicious every day! It's no surprise that the last month of the year is busy for a number of reasons, but things are moving along in game development. I'm working at a verrry slow pace, but I'm just dedicated to not copping out on anything. I'll discuss some game-making stuff again today... I've been talking too much about food lately. I'll try to explain things as simply as possible... emphasis on try. The main thing I'm doing now is creating resources. I created almost every single art resource in Ib myself, and to be honest, that alone takes up an incredible amount of time and effort. On the other hand, creating on the spot exactly what I want to see has significant merits, so it's worth it. This is the work of creating Guertena pieces, as you may be familiar with. Simply placing pixels one by one. It's kind of a dull job! 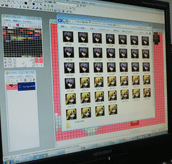 RPG Maker 2000 can only use 256 colors in one palette, so I need to be careful that each image doesn't go over its limit. This painting is planned to appear in the update. By the way, I use a program called "EDGE," which is incredibly easy to use. 90% of the pixel art I drew for Ib was done in this program. The ones that appear when a character is talking. These help to convey with a glance both who is talking and how they're saying their line. One could theoretically do without them, but I much prefer having them. They spice up the look a bit, after all. Below are the face sprites being used in Ib. There are some newly-added ones too. Of course, it's mostly Garry and Mary as there aren't many characters, but I ended up making a lot of them. When adding in new face sprites, I also have to look back at what I had before and ask myself "Would I use this face anywhere...?" If I don't think I would, I delete it from the folder. Also... the full pictures, I suppose. The illustrations done for a few events and the endings. They help convey the character actions and atmosphere in places where little pixels would not suffice. Here's an illustration I was planning to use for a certain scene. Do you know where it would have been used? With the full pictures, I first draw a rough version, then check how it looks in-game. 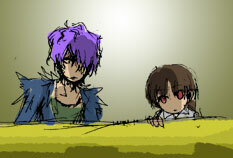 If I think it looks good, I'll draw a better version, but since these pictures can only have 256 colors too, I try to avoid complex illustrations when possible. The resolution is rather small as well, so fine details are lost. I've still many resources to create, but I'll pull through. 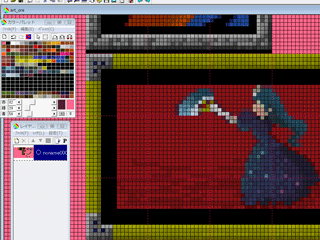 I'm planning to write a post on the character pixel art next time (?). I'm unsure when that will be.